In large bowl, beat first 7 Cupcake ingredients with whisk. In medium bowl, mix milk and vinegar; let stand 5 minutes. In food processor or blender, place 1 avocado, milk mixture, coconut oil and vanilla. Cover; process until smooth, scraping bowl several times. Stir wet into dry ingredients; mix well until there are no more lumps. Divide muffin batter among muffin cups (cups will be full). Bake 25 to 30 minutes or until toothpick inserted in center comes out clean. Cool in pan 5 minutes; remove from pan to cooling rack. Cool completely, about 45 minutes. Meanwhile, in microwavable bowl, heat sugar and coconut oil uncovered on High until oil has melted and sugar has softened, about 1 minute. 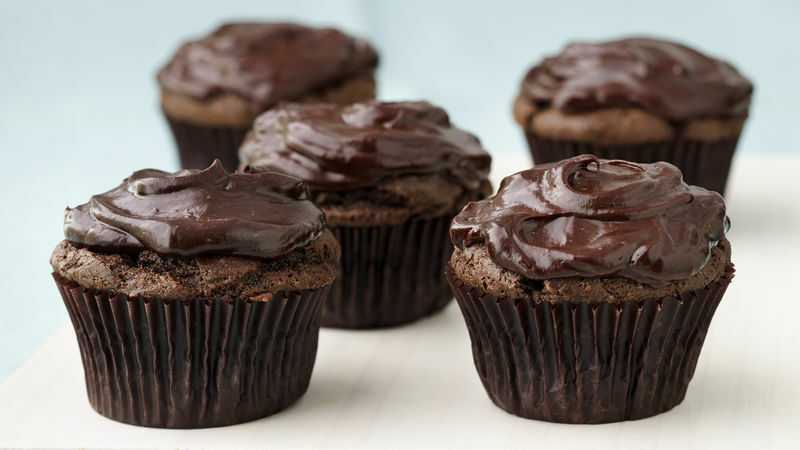 In food processor or blender, place sugar mixture and remaining Frosting ingredients. Cover; process 1 to 2 minutes, stopping to scrape down sides once or twice, until frosting is smooth. If frosting appears too thick, add a bit of water to thin it to desired consistency. Frosting is ready to spread immediately but can be refrigerated if needed, and then stirred to spreading consistency. To quicken the ripening process of avocados, place them in a brown paper bag, and store at room temperature. For even faster ripening, add an apple to the bag. Always read labels to make sure each recipe ingredient is vegan. If unsure about any ingredient or product, check with the manufacturer. A decadent, wonderful cupcake that satisfies the sweet tooth, and it's an egg-free, dairy-free vegan recipe. The secret for this amazing moistness? Avocados!